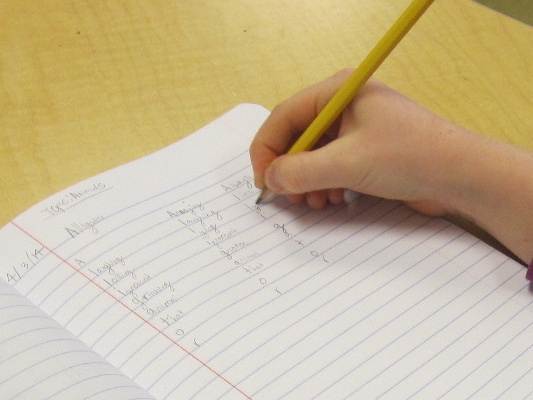 Poetry Day 3- Last Day of the Test, Let’s Write Something That Makes Sense! 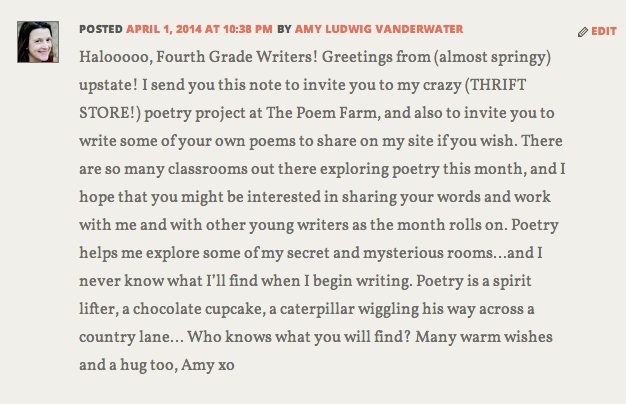 I shared Amy’s site and some of her poems with the kids. They loved hearing her read her own work! 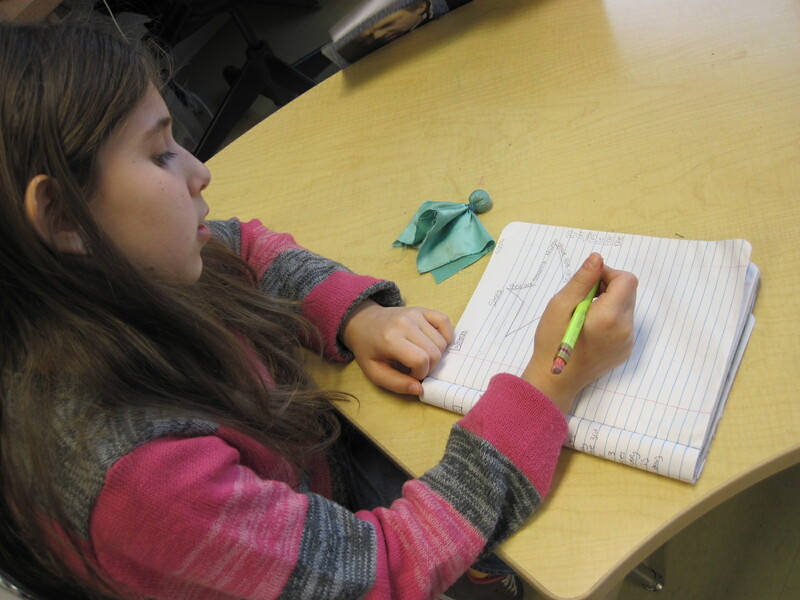 Many of the kids were intrigued by Amy’s monthlong exercise in writing a daily poem about the same topic. 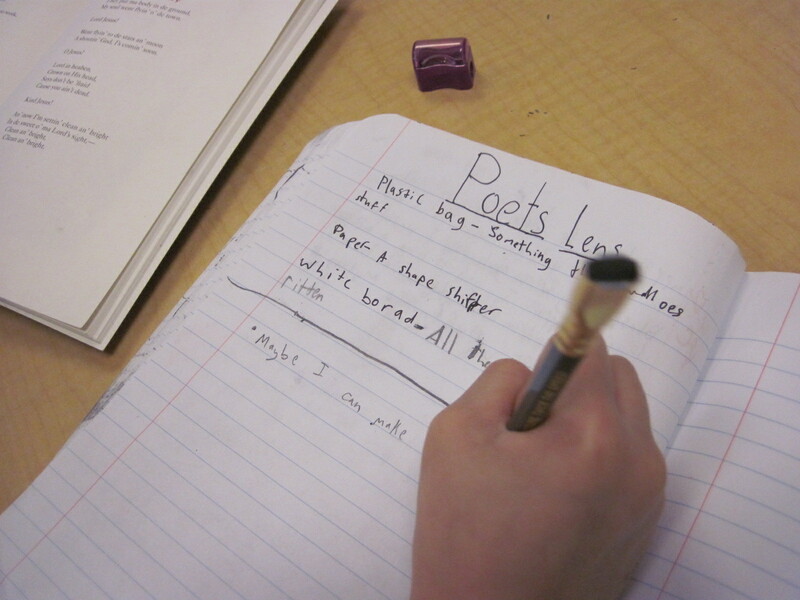 We also talked a little about the poet’s lens, which is one tiny linguistic adjustment I made to use our unit with 4th grade. 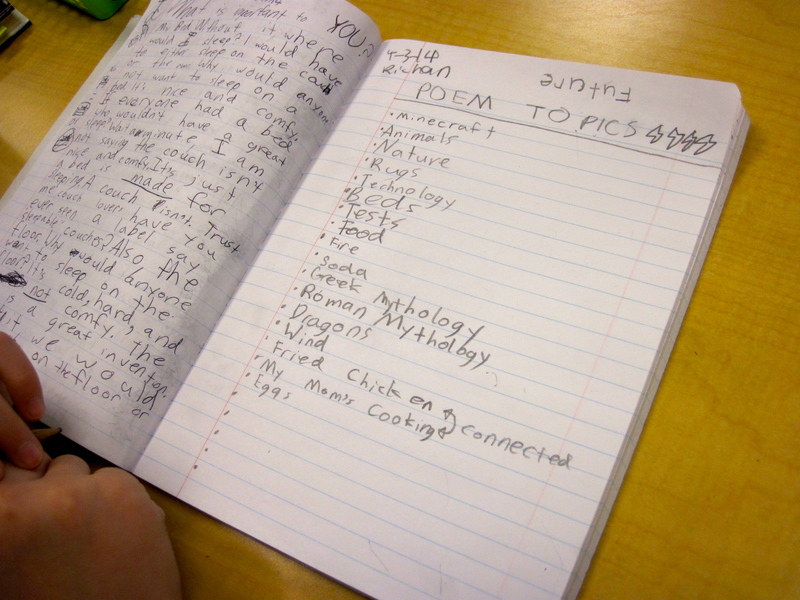 When they went to write, students chose from a variety of options: list possible topics, try out topics to write a bunch of poems about (per Amy’s invitation), start playing around with poem ideas, or anything else they felt could help them get started. Amy’s discussion of her poems- at least the first three of the month- embed implicit teaching into the idea that poets learn from other poets. 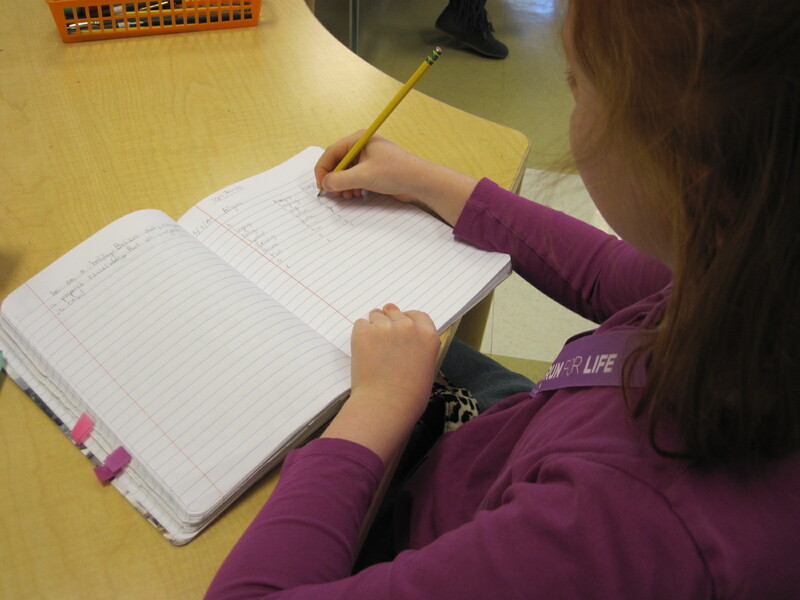 For each poem, she mentions having some inspiration by her side, in her lap, holding her hand, as she begins to write. 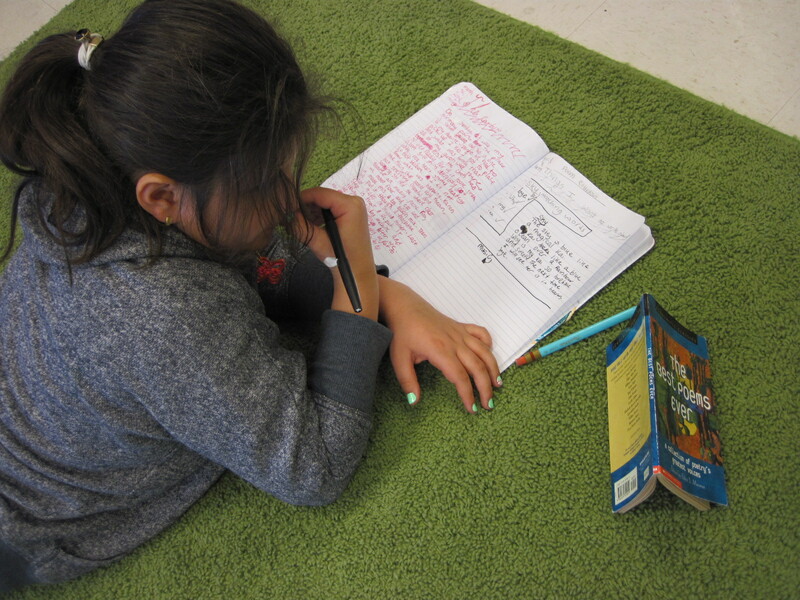 In our workshop today, reading and writing happened side by side. 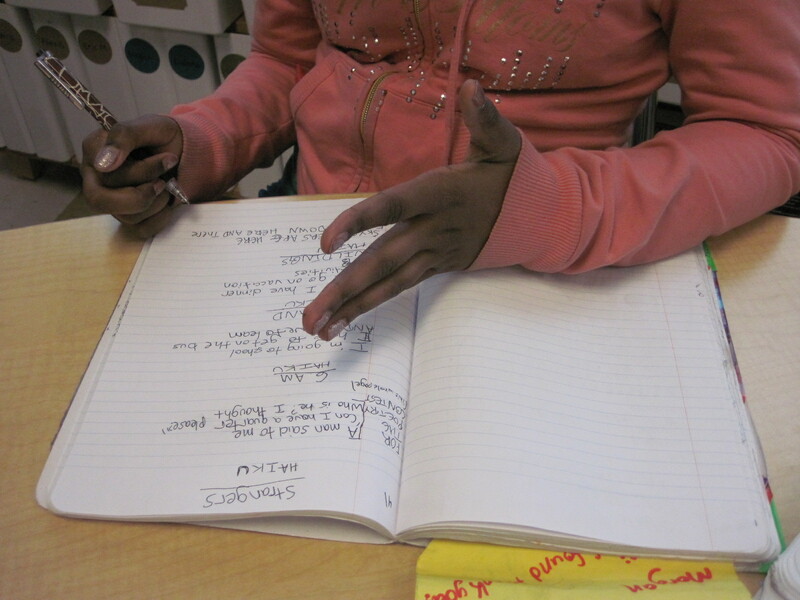 While I had mentioned the poet’s lens, I did not expect kids to explore their own just because I had taught it today. Rather, I wanted to see what they did with relatively few limits. I treated today as an assessment to help me plan the rest of the unit. I know I will not be able to do every session in our book, and I want to be mindful of which ones will work best for the class. Raul uses the idea of a poet’s lens to play with possible metaphors. Richan made a list of possible topics. Inspired by Amy’s jars and the idea of the poet’s lens, Avery is directing her gaze at things that people see but may not notice because they seem boring or everyday. Nina starts with a familiar form- acrostics. She tries several versions with the same original word. 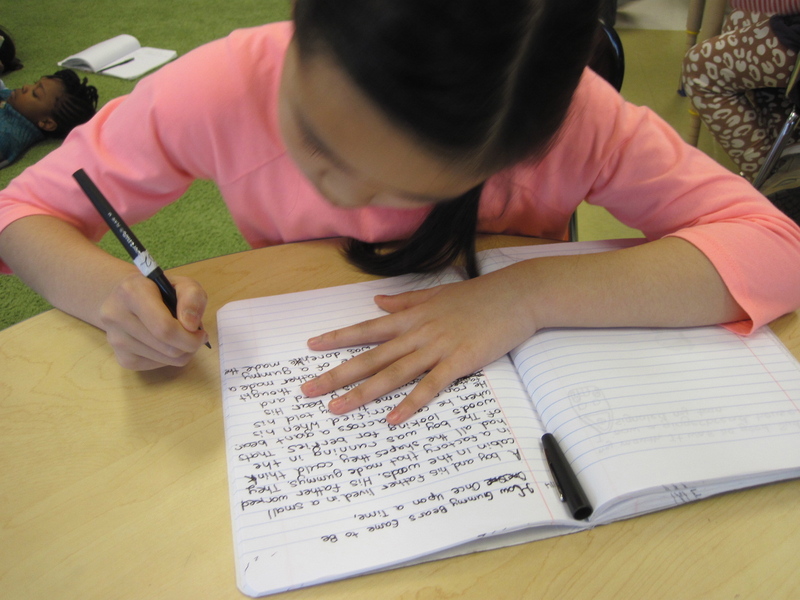 Maya starts out writing about herself. 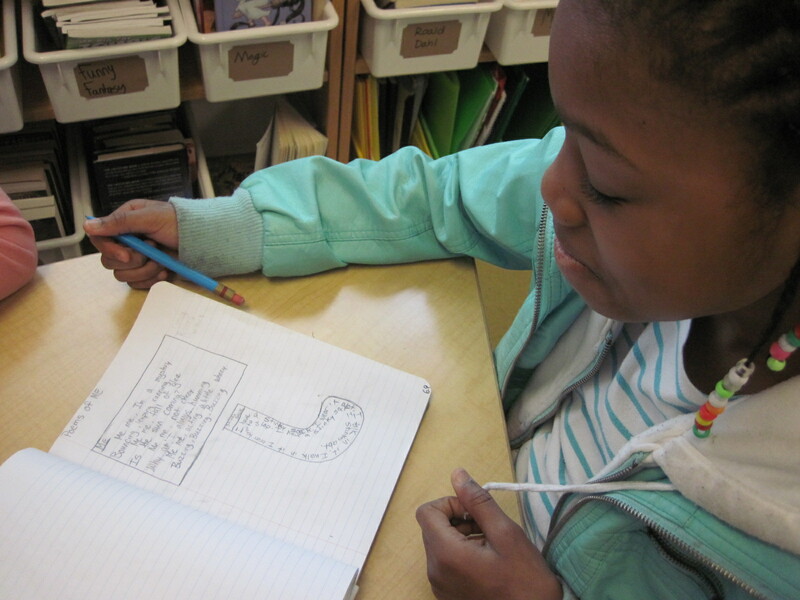 Diana explores writing in the shape of a star. 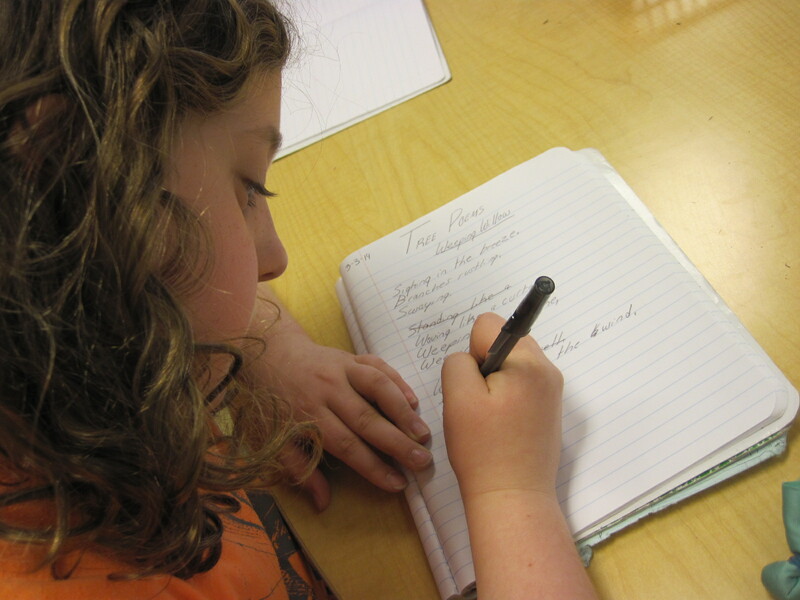 Megan creates a poemdraft (I’m liking this word. It’s helping me distinguish poem entries from other kinds of notebook entries). She starts with meaning, and will look for music in later versions. All of this makes me realize I need less whole-class teaching and more small group teaching. Posted	 April 4, 2014 at 1:06 am by Janet F.
Love seeing your 4th graders so invested in something they want to do and believe they can do well. Also love what Amy LV has created for her April poetry project. I am so glad you are using her work with your students. More teachers need to give their kids this opportunity! I am going to share with a group of third graders tomorrow! 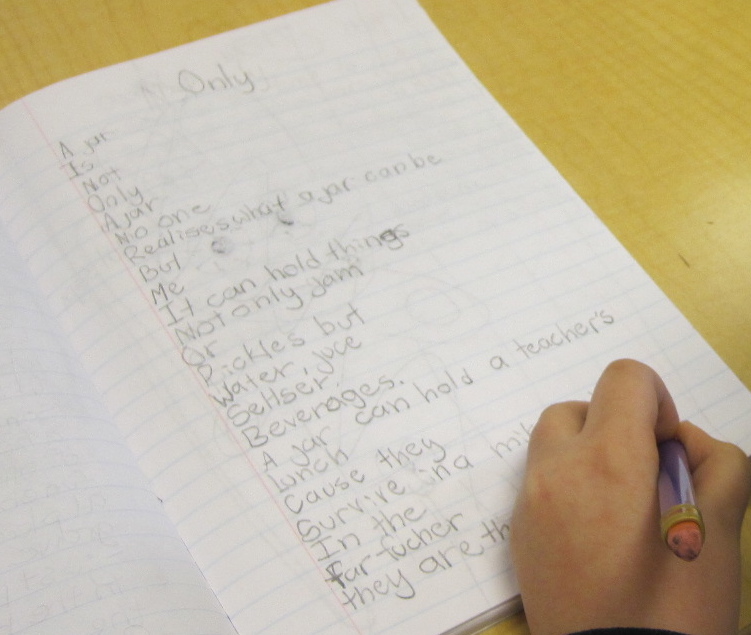 After the first day of the state test this week, I went I to “do poetry” with these same 3rd graders. As I predicted they cheered when they saw me. NOT for me, for poetry. “Oh good, we get to do poetry now.” They love it. They did not cheer when they got the Day 2 books of their ELA exam. In fact I heard that they felt a bit discouraged. 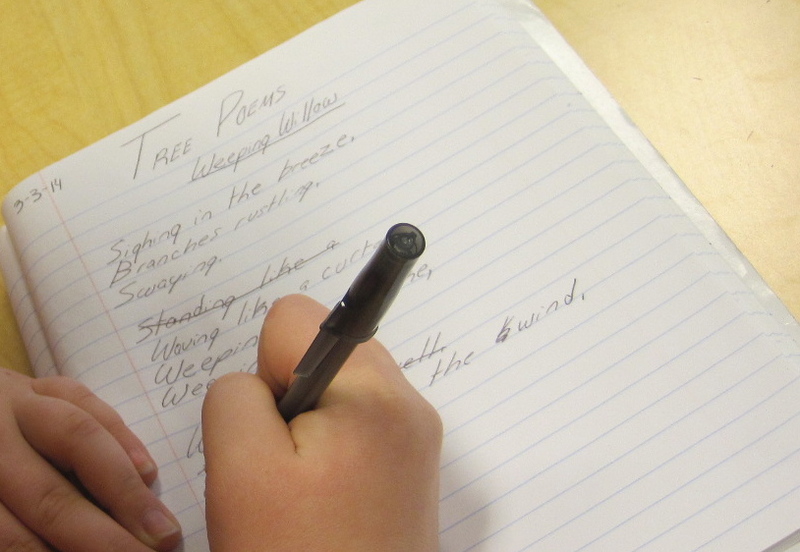 Poetry is a great antidote to stress! I’m sure they were cheering for you, for being the one to bring them the poetry! We teachers tend to sell ourselves short. I hope you all have as much fun as we are! Hi! I’m so glad you saw this. I was about to email you. 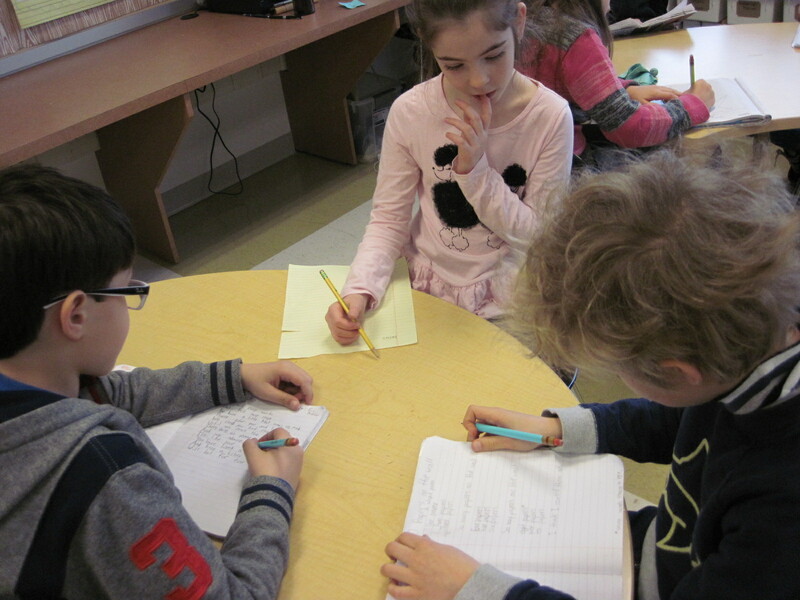 We had some questions: Some of us are thinking about taking on the challenge of writing a whole bunch of poems about the same topic. We were wondering how you came to your topic… or how it came to you. Was it just as clear as could be? Or were there a few topics that held your interest? If so, how did you choose among them? was it hard to commit to Thrift Stores? What are you doing if another poem sneaks into your heart and has to be written? I hope that your weekend was full of finding new and old favorite things to write about. As for your question about writiting many poems on one topic, this idea was one I’ve had for a while. If you go back to the first post, you can read a story that really got me thinking about thrift stores. I wanted to write about something I think matters and that many people can relate to but might be embarrassed about at first. I’m not embarrassed about shopping at thrift stores at all, so I want to celebrate this way of shopping, finding stories and saving money at the same time. There are many other topics I want to write about too, but for April, it was time to pick something. It is hard to commit, yes. So doing so publicly on the blog helps me stick to it. I tend to like to write about lots of different things at the same time, and this discipline deepens my practice. I also learn that there is lots to say about anything if you are willing to sit down and do the work. This blog – and people who read it – help me write and commit and do things that might be difficult for me to try alone. I wish you a beautiful week of reading and writing poetry. 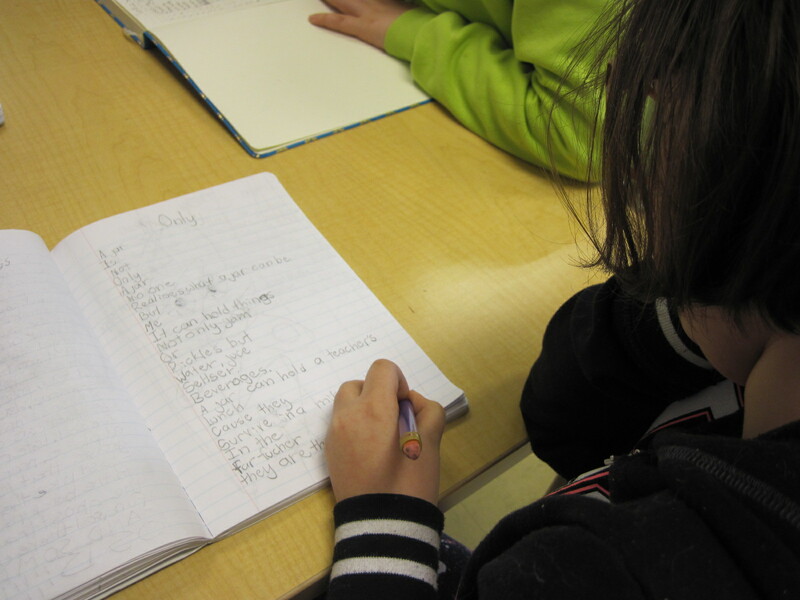 It is interesting for me to read about your process and the poems you are finding meaningful.